From the ashes of a dark and disconcerting year, BlackBerry has risen up and attempted to deliver innovation and beauty in the form of their debut BB10 device – the Z10. The first thing you’ll notice is that the Z10 has about four buttons to its name, none of which have anything to do with typing. That’s right, just like the long-forgotten Storm, it’s a full touchscreen creation. It boasts a 4.2in, multi-touch LCD display, with 1280 x 768 resolution (at 356 ppi) and 24-bit colour depth – perfect for you on-the-go media consumers. The device itself measures 5.11 x 2.58 x 0.35in and weighs in at approximately 136g which is a fair bit larger than the BlackBerrys of yesteryear, as well as the iPhone 5, but it’s still quite light and slips nicely into the average hand. The simplicity of the front design is perfectly in keeping with the business image that BlackBerry portrays, and the glass weave back crested with their signature seven-dot logo makes for a nice, slick finish. Under the hood, you’ll find that the removable battery option is still intact, so if you have any problems it won’t be a hassle to replace. It has an average standby time of up to 312 hours and an average talk time of up to 10, which is a subtle improvement but nothing to write home about. The Z10 also includes 16gb of built in storage complimented by an expandable MicroSD slot (up to 64gb), a monstrous 2gb RAM and a dual core 1.5Ghz processor. Chuck in the 2g, 3g and 4g capabilities and that about wraps up the face value features of this pocket companion. With Android app support, BlackBerry World is looking a lot fuller on this OS, but BB10 is so much more than applications. It is centred on seamless performance and superlative task-management on a level too high to ignore; a concept nicknamed BlackBerry Flow. In the absence of buttons, the phone is controlled entirely by a series of gestures which the initial setup kindly demonstrates. Swipe up and right to “peek” into the all new BlackBerry Hub, the home of conversations – from email to Facebook, everything can be accessed here without closing (or even leaving) the page you were on originally. Swiping down allows you to switch between work and personal mode thanks to a unique idea called BlackBerry Balance, which separates and protects anything you deem to be business-related. Impressed so far? Well, that’s just the beginning. 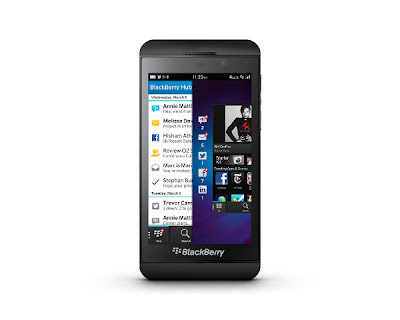 BB10 takes the term “smartphone” very seriously with its predictive capabilities. The incredibly detailed calendar app uses knowledge from your previous events, conversations and social updates to aid you in creating new events with minimal effort. The virtual keyboard also benefits from this, making relevant suggestions as you type which can be selected by simply flicking them into your sentence. For all the neat freaks out there, there’s a hidden gem known as BlackBerry Remember; this is an advanced organisation system which contains a series of folders and is integrated throughout the device, so if you see something you like or can’t afford to forget, you can file it away effortlessly with a few simple taps. Along with the introduction of the 2mp front-facing camera comes BBM video chat, complete with the option to screen share. Screen share lets you ditch your average print screen app and, instead, show your contact exactly what you’re doing on your screen in real time as the call continues behind the scenes. The rear-facing camera is a healthy 8mp and comes with Time Shift, a well-received function that snaps several photos at once. It gives you the option to move between the burst of shots to select the best moment; in other words, no more perfect pictures ruined by unwelcome blinking. Once selected, you have a range of photo-editing tools to play with and the opportunity to share with any social network you choose. Finally, let’s not forget the 1080p HD camcorder which records high quality clips that can be played back on a HDTV with ease via the micro HDMI port on the side. The Z10 has definitely done well in showcasing BlackBerry’s new OS and has paved the way for its future successors – it’s business meets pleasure in the palm of your hand and there’s a little something in store for everybody. If there’s one thing I can fault, it’s the decision to retain Blackberry’s signature, everlasting start up sequence. The ridiculously lengthy security wipe process could’ve gone a miss too, but neither issue affects the phone as a whole. Its unrivalled efficiency has me head over heels in love, but I get the feeling that it may have a somewhat Marmite effect on the nation. Using this device without truly knowing what it’s capable of isn’t a fraction as enjoyable and, since many of people don’t take the time to fully explore, this worries me greatly. Nevertheless, hats off to CEO Thorsten Heins, daresay I’m very impressed.